We talk a lot about pricing here at Price Intelligently. After all, that’s what we do. We’ve published articles on everything from psychological pricing to the pricing process, given away our pricing strategy ebook, developed our price optimization software, and even developed a free course for optimizing your pricing page. This all clearly means one thing: we’re totally biased. Of course, when we say that pricing is the most important aspect of your business we’re just working to pad our own interests, right? Well, not exactly. Yes, we seek to be the premier pricing evangelist out there, and yes talking about pricing does bring us potential customers. But, let us be clear: pricing is not important because we’re in the industry. Rather, we’re in the pricing industry because it’s that important to businesses everywhere. This distinction is imperative. Pricing is important since it defines the value that your product are worth for you to make and for your customers to use. It is the tangible price point to let customers know whether it is worth their time and investment. Below we’ll go into each of these in more detail. Regardless of your product, pricing decisions remain an afterthought for many growing businesses. Your pricing strategies could shape your overall profitability for the future. Depending on who you ask, a business serves hundreds of different purposes and embodies hundreds of definitions. Businesses provide jobs to individuals supporting themselves and families, they produce goods and services for those seeking them, and they even pay taxes to help support public goods. Yet, my favorite definition comes from my Economics advisor back in undergrad, who summed it up simply: businesses exist to provide value. Duh. I know it seems obvious, but take a look at your business. You’re taking your time and energy, mixing it with creativity, and streamlining everything through the allocation of cash and capital. Even if you’re a one-man band, there are hundreds of moving parts within your business, from the sales and marketing, fulfillment of goods and services, and even down to the staff that empty your garbage can at night. All of these individual parts sum up to providing value in the world that another human being is willing to slap down a dollar bill or a credit card in exchange for the intermingling of parts, time, and ingenuity you’ve cobbled together. Your resourcefulness and wit have one purpose that we just alluded to: you want to exchange that value for compensation. Yet, you still need to put a price on that package of value you’ve created. How much was your time, energy, and creativity worth? How much is your customer willing to pay for everything that you did, so they don't have to? Pricing is simply the exchange rate you put on all the tangible and intangible aspects of your business. Perceived value for cash. Everything else then works to justify that exchange rate. Your product teams build the right features for the right audience that needs them. Sales and marketing reveal how powerful those features are to the right audiences. UX folks drive customers through the purchase process, ensuring they don’t churn. Support staff hold the business together and make customers happy through reliability. Everything in your business works to translate and justify your value for a price. Great, we’ve gone through the philosophical justification for why pricing is so important, but a lot of us left philosophy in our freshmen year of college when we were “searching for ourselves.” As such, let’s get into the data. As we’ve mentioned before, pricing is the lever that has the highest and quickest impact on maximizing profit. We’re not just saying this though. Numerous studies have shown just how powerful price optimization can be for a business. In fact, the landmark study was published in a 1992 Harvard Business Review by Michael Marn and Robert Rosiello, both senior pricing folks at McKinsey and Company. 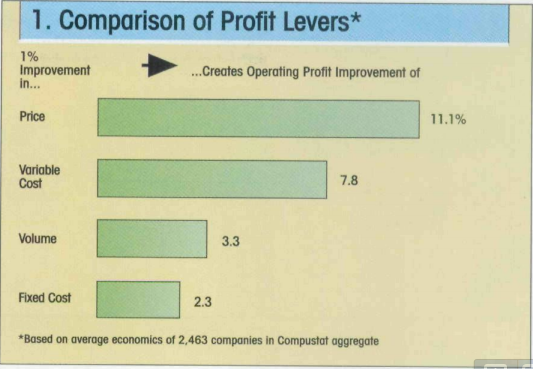 The dynamic pricing duo studied the unit economics of 2,463 companies and found that a 1% price improvement results in an 11.1% increase in operating profit, which compares to 1% improvements in variable cost, volume, and fixed cost only resulting in profit increases of 7.8%, 3.3%, and 2.3% (respectively). With such an extreme leverage on profits, all companies can clearly benefit from price optimization, because so much money is on the table for the taking. When looking at pricing, we often get so caught up in how the pain of optimization that we rush to streamline costs or boost volume through creative marketing, because these channels seem much more tangible and negotiable. These avenues clearly do work, yet you’re missing an enormous payout or leaving an even larger one on the table by avoiding the big green elephant in the room. Stop guessing, and start taking pricing seriously. No idea where to start? 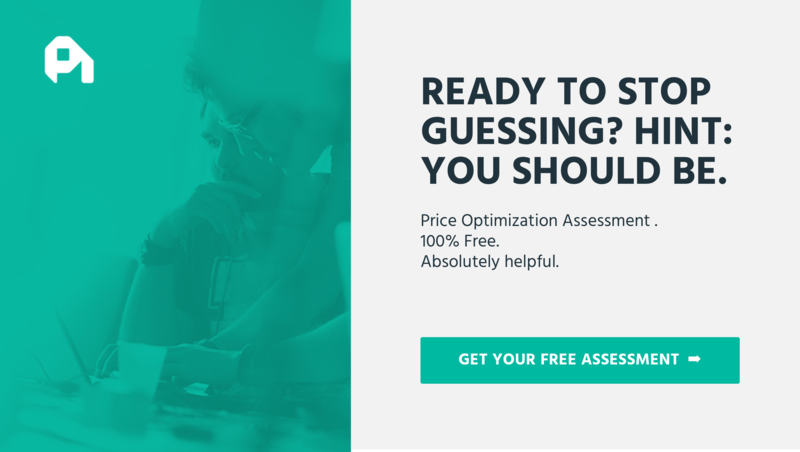 Well, sign up for a free price optimization assessment. Our software may not be for you and that’s perfectly fine. We’re here to help with pricing in any form, and know where to steer you if we can’t help. We simply want you to stop wasting money and leaving cash on the table. Feel free to also check out our pricing strategy ebook or pricing page bootcamp. Both are great resources for getting you started.